DO YOU WISH TO REVITALIZE THE AM RADIO SERVICE? START LISTENING WITH A BETTER ANALOG AM STEREO TUNER! Federal Communications Commission was seeking electronic comments in its filing system to revitalize the AM radio service broadcast band in the United States until January 21, 2014. This was our chance to be heard on this important issue! Further details are located here>> Proceeding Docket Media Bureau 13-249. Brian J. Henry of Napa, California, completely understands what needs to be changed for the AM broadcast band to be revitalized! Brian writes, "Without an improvement in AM broadcast receivers, there can be no AM revitalization! The single biggest factor in the technical decline of AM broadcasting lies with the deterioration in receiver performance. The vast majority of AM broadcast receivers do not have wide bandwidth audio frequency response that matches the transmitted audio frequency response, and their audio frequency distortion performance is orders magnitude worse than that of the worst commercial AM broadcast transmitter ever manufactured. I believe that the public interest would be served by The Commission mandating an analog audio quality standard for AM broadcast modulation and demodulation with flat end-to-end audio frequency response from 50Hz to at least 7.5kHz- with a 10kHz receive notch filter, and low audio frequency distortion that is modeled after the Electronic Industries Association and National Association of Broadcasters AMAX certification program to help AM regain some of its technical footing." We agree with Brian's comments and also support the AMAX initiative, authored more than 20 years ago, and still worth its weight today. In order for AM fidelity to improve, there has to be received analog audio fidelity complemented by the broadcast audio fidelity. Matt Krick, AM music station engineer, writes to the FCC: "It has come to my attention that the vast majority of AM receivers on the market are designed with 'Good Enough' mentality and quite frankly make anything received sound like mud. I'd like to propose the FCC implement requirements for manufacturers of radios to actually design a decent performing receiver." meduci has answered your calls! Wideband high fidelity AM analog tuners are available from meduci since late 2005. Unlike conventional AM radios, meduci tuners are optimized for music, and reproduce many limitations of the air interface and AM station's transmitter. This increased fidelity and crisp reproduction of the transmitted source program material may now be fully enjoyed and appreciated by the audiophile expert. For the first time in radio history, AM fidelity is not strictly limited by the receiving equipment. Virtually all other available AM medium wave receivers and tuners drop audio fidelity to 2kHz maximum response. This is good for a telephone conversation, however not for long-term listening sessions to high definition music programing. Will the FCC mandate that all manufacturers to build and to sell higher fidelity AM radios? This is not likely. FCC is not in the business to advocate how well an AM radio receiver sounds or receives stations in its overall performance. Can the FCC stop the HD Radio madness on the AM broadcast band? Yes, definitely! Brian J. Henry further writes, "The vast majority of licensed AM radio stations are not embracing in-band / on-channel digital operation and those that are only exacerbate an already bad situation with regard to interference to analog operation, particularly at night. There is unfortunately no way for there to be a high fidelity analog AM broadcast transmission system when there is a digital service operating in the audio pass band between 5kHz and 15kHz. The current combination approach is not benefiting either technology. They simply are not compatible. I feel that the public interest would be better served if the Commission authorized full AM digital operation at the broadcaster's discretion in lieu of analog operation. Implementing AM stereo may be a viable path forward for AM broadcasters until enough digital receivers have been acquired by the public to make the switch to all-digital transmission a worthwhile consideration, especially since some recently manufactured HD receivers are able to decode C-QuAM AM stereo." WBT "NewsTalk 1110" in Charlotte, North Carolina conducted an all-digital HD Radio test broadcast on August 18, 2013 to meaure the strength and fidelity of their broadcast. We heard this all-digital HD Radio test broadcast, and we were not impressed with the WBT HD audio sound quality. It was far from being exceptional. In fact, it sounded very artificial, especially when music snippets were played. This all-digital transmission method will not revitalize the AM broadcast band. WBT also reportedly used an omni-directional pattern during the all-digital test, since their directional pattern was not up to the task. WBT has not conducted subsequent tests, and we can only conclude that the all-digital test failed. During their promotional announcement, it was stated, "WBT is one of a handful of radio stations in America that is capable of broadcasting in digital HD." We agree with that statement. There are many technical reasons why HD Radio is not more widespread, especially for night-time AM broadcasts. What can you do to receive better sounding analog AM radio broadcasts? meduci sells quality wide band high fidelity AM stereo tuners and decoders intended for the C-QuAM stereo format. Our newest model, the MW-2 PLL tuner, boasts recovered audio bandwidth beyond 10kHz in the "wide" mode, and 5kHz bandwidth in the "narrow" mode. This fidelity competes with other media devices. Our tuner is the answer to the availability shortage for high fidelity AM tuners today. Our analog tuners are intended to be a large part of the AM broadcast band revitalization process. NEW MEDUCI MW-2 PLL IC )))AM STEREO((( AUDIOPHILE COMPONENT TUNER !! Introducing the new MW-2 PLL high fidelity electronic tuner, which has a very special AM stereo section, that is quite unlike anything else: it is wide band, and has a Motorola C-QuAM stereo decoder, showcasing natural sounding fidelity with very low audio distortion! This professional quality MW-2 PLL tuner is our most advanced tuner offered to date -- updated and re-packaged to build upon the renowned strengths of our two previous consumer AM stereo tuner models. Since it has such great AM response, it also has a patented notch filter to remove inter-carrier beats. It has a very clever and patented noise blanker to improve listening, and most importantly, has superb high-frequency audio response not found on other consumer AM tuners. Our latest AM stereo C-QuAM ultra high fidelity wide band home consumer tuner model has two I.F bandwidths- wide and narrow. Even at narrow bandwidth, the AM section is far superior to any other consumer AM tuner. In all honesty, all consumer AM tuners sound like you are listening through a paper-towel roller because consumer tuners roll-off the high and low audio frequencies. This meduci MW-2 PLL tuner does not roll off frequencies, and sounds like a professional AM broadcast monitor. Listen, and you will be astounded: the AM section of this meduci sounds better than AM HD radio, because it has none of the digital data compression artifacts that makes HD radio sound swimmy, wishy-washy, and artificial. Our latest AM stereo C-QuAM ultra high fidelity wide band home consumer tuner model has continuous electronic tuning- either in 9kHz or 10kHz frequency increments, set at the time of manufacture. This is an intuitively simple device for manually tuning to your desired AM medium wave station's frequency. This rotary tuning mechanism does not have any mechanical analog tuning stops, so you can tune directly, instantly, and simply from the band edges (say from 530kHz to 1710kHz), or in-between these band edges on the station dial. This tuner also does not share its chassis with any FM tuner components. It is exclusively the AM tuner! We experienced very encouraging results when using new old stock Motorola AMAX stereo chipset (MC13027/MC13122). At the moment, we are experimenting with different circuitry to provide variable recovered audio bandwidth based upon incoming signal strength. We hope to continue with significant development efforts in this regard. WIDE / NARROW BANDWIDTH SELECTION -- This standard feature allows you to narrow the tuner's I.F bandwidth for night-time conditions or for "DX-ing" weaker stations. Being stuck with one extra-narrow or extra-wide audio bandwidth is not all that practical for the different reception conditions that we encounter on the AM band from day-to-night -- this dual bandwidth feature provides your MW-2 PLL tuner with much more versatile operation. Unfortunately, the wider bandwidth from MW-2 PLL tuner does not afford satisfactory listening from lower powered very distant AM stations. NRSC AUDIO DE-EMPHASIS SELECTION -- This is another appreciated feature that improves the audio frequency response from those AM stations that transmit with the NRSC audio pre-emphasis curve in the United States. AUTO STEREO / FORCED MONO SELECTION -- There may be rare instances when a received mono AM station may false trigger the C-QuAM stereo decoder circuitry into action. In this case, you would want the forced mono selection to be enabled. BRIGHT RED LARGE AM STEREO INDICATOR -- Provides solid confirmation that you are listening to C-QuAM stereo broadcasts (where available). This AM stereo indicator is not present on any other new receiver offered today, however you can find it on the front panel of your new MW-2 PLL tuner! CENTER TUNING LOCK INDICATION -- This feature provides positive confirmation that your very own AM external indoor tunable loop antenna is centered and locked onto your favorite AM station's signal! Simply rotate the tuning knob on your attached loop antenna until the center tune lock indicator illuminates on your MW-2 PLL tuner! This green indicator is integrated into the rather large, bright, high contrast 24-segment green digital numeric frequency display (14.2mm, 0.56" height) in the upper right area. Boasting better-than-broadcast quality reception, and extremely low noise across the audio spectrum, your MW-2 PLL tuner is a winner in both function and performance. This new MW-2 PLL tuner has rock solid, precise, and stable operation -- with user interface directly under custom microprocessor control -- and this tuner even makes mono AM stations sound better, thanks to full-wave envelope and synchronous audio detectors! In weak signal conditions, your MW-2 PLL tuner also offers blend to mono. There are less negative effects ("platform motion") encountered from sky-wave ionospheric reception conditions, compared to the reception from first generation MC13020P AM stereo decoders- as used in Carver TX-11a, Realistic TM-152, J.C Penney Modular Component System (MCS) 683-3050, J.C Penney MCS-2275, J.C Penney MCS-2276, J.C Penney MCS-2277, Marantz SR-940, Carver TX-11b, Carver PSB-11, and numerous other older AM stereo tuners and receivers. This new tuner favorably competes with Carver's TX-11a tuner in fidelity, whose original AM stereo design is now over 30 years old. All stations on your MW-2 PLL tuner are drift-free thanks to Motorola digital Phase Locked Loop synthesizer to provide precise tuning (automatically, of course). This evolutionary feature eliminates all microphonics, unstable operation, and tuning drift, thanks to the quartz crystal electronic tuning circuit timebase. Also, the tuning range is not condensed in the upper end of the broadcast band. Touching the tuning knob or moving your MW-2 PLL tuner will not upset the rock solid frequency lock on AM stereo and monaural stations. Highly Effective Automatic Noise Limiter -- Reduces impulse noise pops from the audio output. Either 9kHz or 10kHz station tuning steps are included in this new phase stable design, based upon tuner's shipping destination at the time of order placement. We made several cosmetic improvements to the overall external appearance! These improvements include black exterior, with nice contrasting white lettering on front and rear aluminum panels. All is housed in new attractive black ABS plastic cabinet, which measures 179.5mm long by 154mm wide by 51mm height. Excellent sound, ease of use, and convenient features are all wrapped up in this MW-2 PLL wallet-friendly tuner, ready for your devoted audiophile's tuner collection! Your MW-2 PLL tuner is designed for high fidelity reception from local and regional AM stations. We strive to earn customers for life. We only want good experiences from our products throughout the world, so we stand behind each and every sale. We also service our products, if needed. Please let us know if you any questions, or suggestions for this new and improved, re-designed tuner. We hope to have our new MW-2 PLL tuner ready in the next few months for sale to AM stereo fans. We provide one linear (non-switching) type power supply with each domestic sale, capable of stepping down your 120-volt A.C household utility power to 12-volts D.C, tip positive. You could also power your MW-2 PLL tuner from an external +12-volt D.C battery source. This tuner is new, hand-made to order, and is directly sold from the manufacturer. Assembled in the United States of America from U.S and globally-sourced parts. Each MW-2 PLL has the features and performance to make it THE LEADER among all AM Stereo tuners available today. For MW-2 PLL Owner's Manual, please click on>> this link. Bobby Cox and Tom King from Kintronic Laboratories showed their fondness for C-QuAM AM stereo by proclaiming "Come hear what AM Radio can really sound like using today's technology." 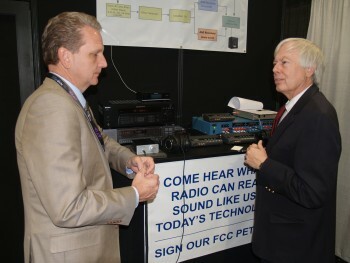 They also answered questions in their booth at the National Association of Broadcasters Spring 2014 show, and discussed C-QuAM AM stereo technology and the FCC petition that they organized to improve the AM broadcast band. Anyone willing to listen to high fidelity AM audio was greeted with a pair of headphones for a shoot-out test. Both the Carver TX-11a and Sony XDR-F1HD tuners definitely showed the disparate differences in AM tuner audio bandwidth and distortion in these headphones. Alan Alsobrook and The Broadcasters' Desktop Resource reported on the NAB festivities. (3) The need for FCC authorization of AM synchronous boosters. Unlike FM translators, such on-channel boosters would serve to increase the AM stations' audiences while concurrently maintaining the future viability of the band. The related technique of wide-area AM synchronization for coverage improvement will also be addressed. High overall RF sensitivity, selectivity, and dynamic range, to provide adequate amplification of weak signals, even in the presence of significant adjacent- and/or alternate-channel signals, especially in strong-signal environments. This would incorporate typical advanced, multi-stage AGC action, with appropriate interaction between the RF and IF AGC control mechanisms to maximize overall receiver dynamic range, including adaptive front-end attenuation for signal-overload protection in very strong-signal areas. Useful typical specs include: sensitivity - 1 mV for 10-dB SNR; selectivity (adjacent-channel) - 25-50 dB (adaptive). Highly effective noise (EMI) rejection, including staged RF and IF noise blanking, accompanied by appropriate audio blanking and/or expansion when required. Such features were developed and included in Motorola chip sets in the 1990's in the AMAX program, and are easily integrated into modern, high-density AM/FM receiver chips.